Bemsha music’s purpose is to provide the finest in live music, specifically catering for the corporate/hospitality market. Bemsha music prides itself on providing musicians of the highest quality; many of whom have international experience and have either graduated or currently lecture in Jazz Performance at various tertiary institutions in Auckland/NZ. 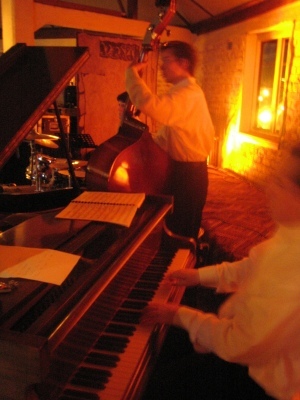 Company founder, Timothy William (an established pianist/producer/musician in his own right) launched the company in 2005 as a means to provide the highest quality live jazz. When you deal with Bemsha music you deal directly with the musician(s) who will be performing at your event, this results in clear and effective communication. Bemsha music offers a unique and original presentation of music. Stearing away from covers/rock bands/djs and into a vibrant, refined and sophisticated live act(s). Bemsha music has a contemporary approach to live music, avoiding the ‘stuffy’ and ‘stagnant’ style, which afflicts alot of Jazz music today. As an event manager or host it is ideal to have one act or band that has the flexibility and ability to perform in any environment. Bemsha music can provide music for a light ‘cocktail’ jazz set at the beginning of an event or something a bit ‘livelier’ or upbeat for later on. Being able to read and interpret the tone and mood of an event and playing a repitiour to complement this is vital to the effectiveness of live music. Bemsha music is a perfect match for any function or event, offering the finest music and musicians to suit every environment. Click here to contact Bemsha music for the perfect musical soundtrack for your next event.